The Dow Jones industrial average is flirting with new highs virtually every day, but Maui-based stock expert Barry Hyman isn't jumping on the bandwagon. He said the market's rally after the Federal Reserve stopped raising interest rates indicates that investors have taken the "glass is half-full" approach. That doesn't mean, though, he's not benefiting from this new-found euphoria. Hyman, vice president-management team for the Maui branch of Michigan-based FIM Group Ltd., posted a 19.5 percent gain through the first three quarters of this year to lead five other local experts in the annual Star-Bulletin survey of best investment ideas. Hyman's hypothetical $20,000 portfolio stood at $23,890.69 on Sept. 30. Richard Dole, chief executive of Honolulu investment banker Dole Capital LLC, was second with a 10.1 percent gain to $22,022.34. Alan Matsuda, a Hawaii-Kai based certified financial planner and registered investment adviser, was third with a 7 percent gain to $21,403.66. 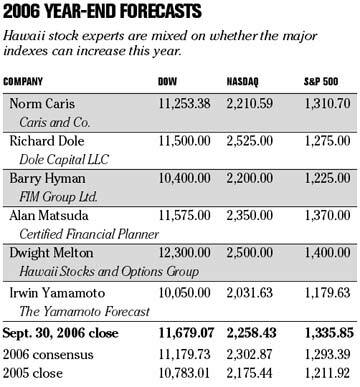 Maui resident Irwin Yamamoto, editor and publisher of The Yamamoto Forecast, was fourth with a 3.5 percent gain to $20,706. Norm Caris, who lives on Kauai and is managing director-institutional sales for Caris and Co., a national institutional research firm, was fifth with a 1.7 percent loss to $19,651.80. And Dwight Melton, the two-time defending contest champion and co-founder of the Hawaii Stocks and Options Group, was last with a decline of 23.2 percent to $15,369.26. Hyman, a value investor who for the last several years has seen better opportunities overseas, said he's concerned that the housing slowdown could become worse and that the market will continue to be complacent about the potential for slower corporate earnings growth. "With U.S. stock market multiples near historical average levels, the primary risk to the broad U.S. equity markets is the direction of corporate earnings and the forward-looking outlook for U.S. consumption and business investment," he said. "As we expect the main engines of global growth (the United States and China) -- as well as domestic consumption driven in the past few years by rising home-equity values and refinancing -- to slow into 2007, I am cautious on the outlook for U.S. earnings and therefore do not expect significant U.S. stock market upside into 2007." Hyman isn't alone among the contest's stock pickers. Yamamoto has been in cash all year and still advocates that position while Matsuda has shifted his portfolio to all cash for the fourth and final quarter of the contest. Yamamoto said the market already has factored in the pause regarding interest rates and that stocks can no longer count on that as a catalyst. "There's a major disconnect," he said. "The market trades near its record high. At the same time, the once-vibrant economy is slowing down in a significant manner. An imminent collapse of the real estate market, coupled with a record level in consumer debt, points to a hard economic landing. This scenario clashes with investors' perception and hopes of a soft landing." Matsuda, who led the contest at the midyear point, sold his entire portfolio to lock in his gains for the year. "Losing money, especially other people's money, is serious business and is as easy as a football player getting injured -- the ol' blind-side hit!," Matsuda said. "October has been historically a dangerous month for stocks, and the upcoming November election will result in negative effects on the stock market as Republicans, steadfast about continuing tax cuts which is sheer nuttiness in Democrats' minds, lose their majority in Congress, and our president loses more respect at home and abroad." While Matsuda acknowledges there's a chance of another "Santa Claus rally" in late December, he said it's not worth the downside risk which "can be very big." Matsuda's top picks were streetTRACKS Gold Trust, which rose 15.3 percent over nine months, and ocean shipper Seaspan, which gained 10.5 percent after he added it to his portfolio following the first quarter. He said energy, real estate, gold and emerging markets are no longer in favor, and that companies to seek out now are those that will prosper as China spends money in the future to solve its energy and pollution challenges after the country is done spending for the Beijing Olympics and the Three Gorges Dam. Hyman has made some adjustments in his portfolio for the fourth quarter, including selling half of his stake in Florida insurer 21st Century Holding, which posted a 42.5 percent gain in the third quarter after Hyman picked it up at midyear. He also sold his full position in Liberty Global, a broadcast services and programming company that rose 18.2 percent through the first nine months of the year. In their place, Hyman bought Action Products International, an educational toy company that has suffered from management missteps; and Cimarex Energy, which has good long-term fundamentals and whose stock became attractive after the negatives affecting natural gas prices became overdiscounted . Action Products International was down 24.4 percent after three quarters but has since rebounded to a year-to-date gain of 5.2 percent. Cimarex Energy was down 17.9 percent through three quarters and year-to-date has trimmed that loss to 17 percent. Hyman and the other stock pickers were required to make any changes in their portfolios before the fourth quarter began. "On the view that a U.S. slowdown doesn't turn into something more extreme, Asia remains a fertile hunting ground for stocks that offer compelling value," Hyman said. He said sectors that concern him now are investment bank/brokers, U.S. auto manufacturers, and mining/commodity companies. Dole, who has kept his portfolio intact the entire year, said he is looking for at least an economic slowdown and possibly a mild recession. "The market will likely move between sectors and show very little net change over the course of the (next) year," he said. Dole had three of his five stock picks up more than 20 percent at the third-quarter mark. Defense giant Lockheed Martin was ahead 36.9 percent; pharmaceutical behemoth Pfizer was up 25 percent; and Newport, a supplier of scientific and technical instruments, was up 20.4 percent. His one local pick, Alexander & Baldwin, was off 16.9 percent. He said sectors he likes now are health care because of demands for an aging U.S. population, defense because of the instability in the world, consumer staples because they are recession resistant, and technology because of its importance of improving productivity and reducing inflation. He singled out commodities and cyclicals as among the worst sectors because they have high fixed costs and low profit margins. Yamamoto, who hasn't wavered in his yearlong belief that the U.S. stock market is overpriced, is sticking to the highest-yielding bank money market or savings account as surveyed by Bankrate.com. Thus, he's switching his entire portfolio this quarter from HSBCdirect to Pleasanton, Calif.-based E-Loan, whose savings account is yielding 5.36 percent. "The stock market is in the midst of setting up the mother of all traps," he said. "Something bad is developing beneath the headlines." He points to the 9,000 hedge funds that have $1.225 trillion of assets under management and often use derivatives -- a risky financial instrument -- to make highly leveraged bets when market sentiment, either bullish or bearish, is at an extreme. "Legendary investor Warren Buffett said that the derivatives market is a 'mega-catastrophe waiting to happen,' " Yamamoto said. Caris, like some of the other stock pickers, also points to a breakdown in the housing market and the potential fallout as creating problems for the market. He points to rising inventories and the first year-over-year price decrease in 11 years. "We are particularly negative on the Hawaiian real-estate market and economy," he said. Caris' top picks through three quarters were optical supplier Oakley, up 16.1 percent; and semiconductor equipment maker Novellus, up 14.7 percent. Hawaiian Holdings, the parent company of Hawaiian Airlines, was up 4.3 percent. "The market will likely remain flat for the rest of the year, depending on whether the Democrats gain control of Congress in the November elections," Caris said. Melton, whose bets on momentum growth stocks turned sour this year, is trying to capitalize on the market's recent rally with three new selections. He bought Gymboree, a children's clothing retailer; OM Group, the world's largest producer of cobalt; and CPI, which operates photo studios in Sears department stores. He took losses in selling Daktronics, which supplies electronic scoreboards and various display systems for sports, business and government; TETRA Technologies, an oil and gas services company; and Joy Global, which makes heavy equipment for the coal-mining industry. Two of the stocks he sold, Daktronics and TETRA Technologies, he held for only one quarter. "This was another bad quarter for my stock selections," Melton said. "I still have three months to regain the lead." Melton said even though the economy is slowing down, he doesn't think a recession is looming. "Investors are hanging in there," Melton said. "Stocks have rebounded nicely from their May and June lows, with falling oil prices and greater stability on the interest-rate front being supportive. I believe the bulls will retain the upper hand for the next few months."